Instant Car Donation was founded with the goal of bringing donors and local charities together with an efficient and pleasant process. You can focus on deciding which of our respected charities is right for you instead of worrying about difficulties of researching how to make a donation. After your free pickup, we will assist you in recieving the best tax benefit possible for your generous gift. We take pride in helping smaller charities easily receive car donations, bringing people together while helping support those in the Peoria, Arizona community who need it the most. Here are some of our favorite charities in the Peoria area. We have made sure each of them are eligible for tax deductions when you help your local community by donating your car. Your values and choice can make a difference. The Crisis Pregnancy Centers of Greater Phoenix (CPC) was founded in 1982 with the vision of serving the physical, emotional, social, and spiritual needs of women and families who are in crisis because of an unplanned pregnancy. Crisis Pregnancy Centers of Greater Phoenix is one of the largest & most comprehensive pregnancy resource services in the nation, with four clinics in the Phoenix area. The women, men, and teens served by CPC's trained staff and volunteer support team are offered factual information and education regarding pregnancy, abortion and its risks, and the alternative options and choices available to them, FREE of charge, in a caring, confidential and trusted environment. Feed My Hungry Children (FMHC) helps stand in the gap to provide the things that needy, hurting people may need to survive and become self-sufficient. FMHC's humanitarian projects are committed to helping children and their families around the world. Our relief efforts are focused on: providing education, clothing, food, and medical help to school age children; providing health and nutritional training for families and parents of deprived children; helping communities through micro-enterprise and sustainable gardening projects; providing nutritious food to school children; engaging in community development projects to help impoverished families work toward self-sufficiency; and providing education, food, nutritional training, clothing, medical help, and other necessities of life to those in need, including impoverished children and their families. Feeding America's Hungry Children's (FAHC) network of more than 17 regional food banks and food-rescue organizations serves 16 states by distributing food and grocery products to approximately 100 local charitable hunger relief agencies including food pantries, soup kitchens, women's shelters, Community Kitchens, and other organizations that provide emergency food assistance. FAHC solicits donated food and grocery products from the nation's food and grocery industry and distributes it to hungry people across America. FAHC provided services to 13 member agencies in 8 States throughout America. These agencies were the recipients of 1,944,753 pounds of food. Global Training Network (GTN) is a Christian missions organization that provides pastoral and leadership training throughout the Majority World. The vision of GTN is to provide quality biblical and theological training to thousands of indigenous church planters, pastors and Christian leaders so that these pastors and leaders can then effectively equip and lead their congregations to evangelize and disciple their communities for Christ. Jewish Voice's mission is to Proclaim the Gospel, Engage the Church Concerning Israel and the Jewish People, and Grow the Messianic Jewish Community. The Society of St. Vincent de Paul - Phoenix has been serving homeless and economically disadvantaged populations since 1946. Through home visits, shelter, food assistance, employment services, thrift stores and outreach programs, St. Vincent de Paul provides compassion and support to individuals in need, regardless of race, origin, religion or gender. St. Vincent de Paul provides more than 3,500 meals daily to homeless and hungry people at its five Valley dining rooms and at 18 additional nonprofits. SVdP volunteers also provide more than 222,000 food boxes to working poor families and individuals throughout northern and central Arizona each year. West Valley Child Crisis Center's (WVCCC) mission is to be proactive in ending the cycle of family violence through education, prevention programs. and safe placement services to promote healthy family environments for the future of Arizona's children.WVCCC is a child welfare and adoption agency licensed by the State of Arizona. Services provided include foster care licensing, adoption certification, DES and private adoptions, birth mother services, and child abuse prevention services. There are lots of charities, such as Global Training Network, in your Arizona area which can benefit from your automobile, like your Plymouth Prowler, donation. We not only help you contribute to a nearby charity, but we concentrate on supplying an easy method to small local non-profits so that they can concentrate on their work to accept donations. Often the donation is likely to make the largest difference for such non-profit organizations, while helping to encourage those in their Arizona community who want it the most, bringing folks together. It's important to Instant Car Donation which you receive the greatest tax deduction benefit without having to navigate complexities or carry out extensive research, possible. We pre-qualify all of our charities that are participating to confirm your donation would be tax deductible. The procedure will be streamlined to both you and the charity of your choice. We'll provide a 1098-C tax form to you after your donation that is finished. Car donations are the most accountable method for many individuals to create a large donation. Because of this, one of our aims is to enable those making a decision by making sure that the automobile goes to the charity which best represents their values. We always make charity decision an essential part of the process when donating with us. We can do that if you want us to pick that charity, such as Global Training Network, would benefit the most instead. When you have a charity in mind you would like to contribute to, then you can donate with us. When there are many benefits to charities that receive donations from individuals, the advantages to the you, the donor may not be as apparent. The largest benefit which the majority of people hear is your chance for a tax deduction. This usually means that the resale value of the donated vehicle can be written off on your own tax return. There are a few limits on this sort of deduction, so you might want to speak with a tax professional before making the donation. Another advantage of donating a used auto to charity would be the chance to just eliminate the automobile, such as your Audi S6, without needing to try to fix or promote it. Most charitable vehicle donation programs will except vehicles whether they are running or in need of repair. Car donation programs are becoming popular in Arizona over the past ten years or so, as more charities are looking for new and innovative ways to create funds. Nowadays, the amount of charitable automobile donation programs is in the hundreds or even tens of thousands. In case you've got a favorite Peoria charity you want to make contributions to, it's probably possible for that charity to get at least a part of the funds when you donate your used automobile, like a Suzuki Grand Vitara XL-7. Besides the charitable tax deduction and not getting the hassle of handling an older car, like a Isuzu IMPULSE, the sensation of having the ability to assist those in need might be the ideal reason to donate your car, like your D & N Trailers D & N Trailers, to a charity. Most used automobile donation programs will sell your vehicle to increase funds for your cause, utilize the vehicle, like a Mercury Villager, in the everyday operations of their company, or give the car, such as your Falcon F-7, to a someone in need either for free, or for under the fair market value. Charitable vehicle donation programs enable you to donate your used auto to the charity of your choice. Visit our charities page to decide on a charity in Arizona to contribute to. When you choose to create a donation of a used automobile, if the charity sells the automobile, such as your Cadillac Escalade EXT, for more than $500 they are required to send you a receipt that allows you to subtract the sales price of the vehicle in your own tax return. If the older car you decided to donate isn't worth at least 500 bucks, then the IRS allows you to determine the reasonable market value. This is actually the value that someone would be prepared to pay for the vehicle, like your Saab 9-7X, if purchasing it from you. You receive the tax benefit, along with the charity gets to utilize the car, like a Jeep CJ-7, sells it and uses the profits for the good of the charity. That is a wonderful thing for everybody involved. Is there a tax deduction for donating my car in Arizona? We can ensure your vehicle belongs to some charity, for example PetSmart Charities, which is eligible help you recieve a reciept for your contribution and to receive tax deductible donations. If you itemize your deductions you might have the ability to acquire a tax benefit for your vehicle donation. For donations up to $500 you're able to use Kelley Blue Book and to get bigger donations the charity needs to confirm what they recieved to the auto donation (more info). How will my car be delivered to the Peoria charity? 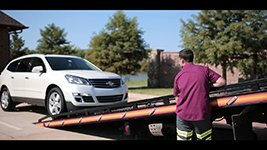 We will organize a tow truck to come get your car and deliver it for you. It could not be simpler now to help the non-profit organization, like West Valley Child Crisis Center, of your choice! Do you accept donations for vehicles that are missing or damaged components? Absolutely, we take cars in all states! Go to the form and ask to contribute, and our Peoria team will see what we can do for you. Would you help me locate a Peoria charity that fits my personal principals? We would love to assist you make sure that your donation goes to a cause in Peoria you care personally about by helping you pick a non-profit organization, for example Global Training Network, that satisfies your own values. This is important to us we do so every single time you contribute with us! What charities do you help in Peoria? Instant Car Donation proudly supports several respected national and local Peoria nonprofit organizations in the area. Our Peoria team works hard for you to be sure the organizaion becomes maximum support from your vehicle. All owners around the car title must finish the part of this title labeled "assignment of title by owner" or "transfer of ownership by seller". Most states require registering and printing owner names. You need to fill out any fields that need information about a buyer/purchaser/transferee with information about who you are donating the vehicle to. You might find directions for your home state here. Just how long does this process take? First we'll contact the non-profit organization, for example Feeding America's Hungry Children, of your choice (or pick one for you whether you asked that rather than picked) to make sure they need your car which takes around one business day. After that wewill arrange to get a tow truck to come to you for pickup. When it's taking a little more time feel free to give us a call. Donations to education charities: $59.77 billion, or 15 percent of contributions, went to education charities. This was up 3.6 percent from 2015. Donations to individual services charities: $46.8 billion, or 12 percent of contributions went to individual services and so were up 4.0 percent. Donations to bases: $40.56 billion, 10% of all contributions went to foundations and so were up 3.1 percent. Donations public advantage charities: $29.89 billion or 8 percent of contributions went to society and public benefit charities, that grew up 5.8 percentage. Contributions to Culture, Humanities and Arts : $18.21 billion or 5 percent of all donations went to Arts, Culture, and Humanities, that was up 6.4 percent. Donations to the Environment and Animals:$11.05 billion or 3% of contributions went to Environment/Animals up 7.2 percent from 2015. At length, the most significant proportion of donations in 2016 went into Religious Organizations: $122.94 billion, went into religious associations, or 32% of all contributions. Since you can see, charitable contributions are increasing, and it is a fantastic thing as our favorite charities, like Creative Coachworks Creative Coachworks need as much help as they can get! At Instant Car Donation we are doing our part to improve charitable donations through vehicle donation. You are able to donate any type of car, including a BMW 323is. It's an effortless way. It's possible to donate your car, whether its a Rolls Royce Wraith or a Holden Volt to assist a nonprofit of your selection, for example Oklahoma City Art Museum, simply fill out the intake form and we'll be in touch to take good care of the procedure. Whenever you make the decision to donate your vehicle, like a Red Baron Motors Red Baron Motors, to support a cause that you care about, you recieve the benefit of a tax deduction - and the charity like WMHT Educational Telecommunications receives the benefit of the financing to sponsor programs or projects. But did you know that your automobile donation can provide the benefit of greener living ? Recycle, reduce, and repurpose are conditions we are very familiar with nowadays. We would like to care for our environment and reduce our carbon footprint, and then conserve the world for future generations from Peoria. We take the opportunity to form our recyclables into steel, plastics, paper and aluminum. But did you ever feel that automobiles were a major portion of recycling? Donated cars, like a Bentley Eight, are in need of repairs and upgrade. And, most of us don't have enough time or energy to fix our cars up so that we are able to sell them ourselves, and fetch the highest price for what we have. That is where we come in. When you donate your car, we arrange a free pick up and sale of your car at a nearby auction in Peoria. In the auction, your car is going to be bid on by a person, used car salesman, or mechanic who wants to give your auto new life, also has time and skills to do it. That's to say by donating your vehicle, you're actually giving it a new function! Who knew that donating a car could achieve a lot of critical goals simultaneously? As soon as we give a vehicle, we benefit a charity like ABC² (Accelerate Brain Cancer Cure) by giving them more comprehensive funding, take the load of fixing up the car off of ourselves, and we recycle and interrogate our car! Can every charity deal with the job it takes to process a auto donation? Sadly, no. West Valley Child Crisis Center might not find sufficient efficacy in managing the towing, titlework and selling of a donated car. And therefore, Feeding America's Hungry Children may not be able to rely on automobile donations as a source of funding. However, through our streamlined process, financing from the selling of your car can really make a difference to non profits such as PetSmart Charities. We can lend charities such as The Center for Family Resources a hands while a greener, more simple life. Junk is out, simple living is in. The majority of us are around our ears in things, and a few of us are trying to do anything about it! We are doing things such as taking our clothing to Buffalo Exchange or giving up on buying new items for the time being attempting to make do with what we've. Who'd have ever thought that many Americans would give up their homes and build miniature efficient ones instead? It is not having stuff which brings us pleasure. It is what we do with what we have that matters. We might have thought of donating clothes or home products to a local charity, however we might not have realized just how much that charity, such as West Valley Child Crisis Center at Peoria, Arizona, would gain from the contribution of a car, such as a Plymouth Champ. If we have not thought about it, we ought to take a minute to reflect on how much most charities, like West Valley Child Crisis Center at Peoria, Arizona, are fighting to make ends meet, or even to finance applications that further their mission. Do you have an unused or unneeded car, including a Toyota PRIUS, carrying space in your garage or driveway? Have you wondered if there's a better use for the car than just sitting there, cluttering your distance? We will be able to assist you downsize, and also do something good for your neighborhood community. Take a look at our website. On the pages of the site are recorded tens of thousands of charities, like The Lustgarten Foundation for Pancreatic Cancer Research. There is guaranteed to be just one in Peoria, Arizona or the neighborhood region that talks to youpersonally, whose assignment which you feel is well worth encouraging. Or, if there is a particular charity which you want you give a helping hand you can tell us the title of charity and we are going to contact them for you, to ensure they can get your donation. Instantcardonation.org is a web site which could enable you to help a charity which speaks to a heart, and enable you to simplify your own life. It won't cost you anythingyou simply have to have a minute or two to press the donate button and send us some information regarding the car that you wish to donate, such as a Mercury Capri. We will arrange a free pickup for your car in Peoria or the community region, and listing on the auction to find the maximum price possible so that we could make the maximum donation possible to the charity of your choice, likeGlobal Training Network. Not only can you get to give your car from the center, but you're also qualified for a tax-deduction. We'll complete your tax receipt and also offer the non-profit with needed IRS paperwork as well as your own donation. Giving from the center could not be easier! Trying to determine whether or not to contribute your car? While donating a vehicle, such as Suzuki Kizashi, is an excellent way to receive a tax-deduction, the benefits of donating your car in Peoria go far beyond tax year. Donating a car makes a true difference for charities, who are looking for creative ways to boost their impact on local communities. Maybe it doesn't look to be a automobile donation could really affect the bottom line of a charity, such as Feeding America's Hungry Children, that considerably, but when we take the time to actually analyze the situation of most little and midsize non-profits within our neighborhood community, we'll likely see they are all doing their very best to serve the biggest amount of people, but with very limited ways. Take the instance of PetSmart Charities in Peoria, Arizona, also a small neighborhood nonprofit. Like every small non-profit, it's always searching for ways to raise its contributions so it may provide additional services to its target area. Though many large nonprofits, like Laura's House, have paid employees that can receive and sell a donated car to boost help boost its revenue, a tiny nonprofit like Global Training Network may not have the staff to accept a vehicle and process your donation of an Alan Autosports Performance Edition. We can assist! We work with charities to be certain that they all have the capability to receive a auto donation. By clicking on the donate button, and donating your car to a small business like this, you supply them with the opportunity to receive unforeseen funding that might extend the duration or reach a current job, or to even start a new project that could have been impossible without your donation. We are going to arrange a complimentary pickup in Peoria and organize to sell your car. All you have to do is tell us about the car you wish to give, such as a Rolls Royce Ghost, and pick the charity that you need to help many. We are connected to a network of tens of thousands of charities and have the ability to reach out into any charity for your benefit. Our goal is to provide necessary funding to every one of those charities who are doing important work in our communities, however, have limited staff and funding. Click on the donate button today and let us put your vehicle donation to work for the good of the community!